Observations of atmospheric temperature, humidity, pressure, wind speed, wind direction, cloud cover, precipitation, visibility, weather type, etc. are essential for several reasons. For instance: (1) Observations help us plan our day in terms of how to dress, whether we need to de-ice our windshields, whether we need to carry along an umbrella, etc. ; (2) Observations are critical for producing accurate weather forecasts. It would be difficult to make an accurate prognosis of future weather without a proper diagnosis of the current weather; (3) Observations are critical for assessing the accuracy of weather forecasts. If scientists altered some component of the computer code that generates forecasts, for example, it’s important to know whether that alteration helped or hurt the accuracy of the forecast. Since atmospheric observations are so important, it’s imperative that they are accurate. Unfortunately, erroneous observations sometimes make their way into the data stream due to a variety of reasons, including instrument errors, data transmission errors, and human errors. Since erroneous observations are a fact of life, we must identify and remove them before they are allowed to influence computer models and other downstream processing. Several rather simple quality control procedures can be implemented to eliminate erroneous observations. The first is a gross error check. This check is the simplest and seeks to identify those observations that fall outside the range of expected values. For example, a surface temperature of 216° F is not likely on our planet, and such an observation would be eliminated from further consideration. Similarly, a sea-level pressure of 1252 mb, relative humidity of -28%, and a wind speed of 313 mph would all fail a gross error check. A second quality control check is a time series check. This check examines a time series of observations from a single station and removes observations that aren’t corroborated by the other observations within the time series. This is a temporal consistency check. 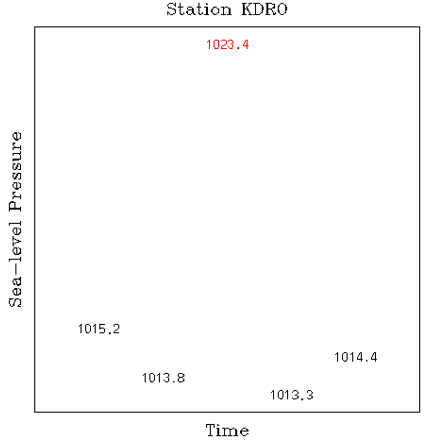 For example, shown in red in the figure below is a sea-level pressure observation from a time series of observations for a particular station that failed a time series check. A third quality control check is a buddy check. This check examines the observations from neighboring stations (collected at about the same time) and removes observations that aren’t corroborated by the other nearby observations. This is a spatial consistency check. For example, shown in red in this figure is a surface temperature observation that failed a buddy check. A fourth quality control check is a model-comparison check. This check compares observations to neighboring gridpoint data from a model analysis or short-term forecast. 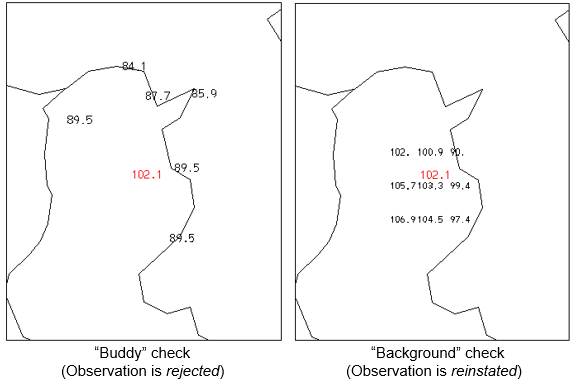 This quality control check serves two purposes: 1) to provide a buddy check-like test on isolated observations (i.e., those without “nearby” neighbors) and 2) to re-evaluate buddy check-rejected observations. For example, shown in red in the left panel of the figure below is a surface temperature observation that has failed a buddy check. However, most of its “buddies” are along the coast, where summertime afternoon temperatures usually are cool compared to inland stations. By implementing a model-comparison check, we can re-instate the rejected inland observation, since its value is in close agreement with neighboring model gridpoint values (right panel). Finally, various common-sense checks can be applied to the observations. 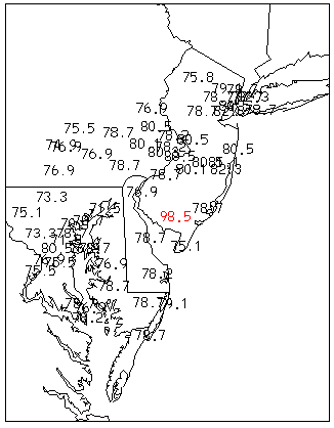 For example, the dewpoint temperature should not exceed the temperature; fog observations should be associated with high values of relative humidity; precipitation type should be consistent with temperature.